Euro 2016 has seen some surprises already, but what about the quarter finals? Football in 2016 is following a pattern; the underdog tends to prevail. This pattern has continued throughout Euro 2016, with teams like Hungary, Northern Ireland and Slovakia progressing to the knockout stages. Iceland, Poland and Wales have gone one further, making up 3 of the last 8. The way this tournament has panned out, with quality not always on show and the lack of impact from some of the stand out names have led to the quarter finals being virtually impossible to predict. I will try my best to predict what we will expect to see in the quarter finals of Euro 2016. Perhaps the most unpredictable of the four quarters, as arguably neither side has shown the quality to warrant a place in the semi-finals. Poland got to this stage by edging past Switzerland via a penalty shootout, and Portugal should perhaps be out, however they scraped into third place in their group – behind Hungary and Iceland – then looked disappointing as they relied on a 116th minute extra time winner from the veteran Ricardo Quaresma to see of a far superior Croatia side. Poland’s strengths are usually in the attack, as they boast one of the best forwards on the planet in Robert Lewandowski, however he has failed to hit the heights we know he can reach. Instead of their attack, it’s the Polish defence which has been their driving force this tournament, as they have only conceded one goal so far, an outrageous strike by Switzerland’s Xherdan Shaqiri. This backline, in particular Dortmund’s Lukasz Piszczek, will need to be as solid as ever, to keep out the likes of Ronaldo, Nani and co. Should Poland defend like they have throughout this tournament thus far, there is a strong possibility they will progress to their first ever European semi-final, especially if they can get Lewandowski firing. As for Portugal, they have perhaps been the most disappointing out of all the quarter finalists, managing draws in 90 minutes of all their fixtures so far. It’s impossible to predict which Portugal will show up, purely based on the fact that the main man, a certain Mr Ronaldo has been so hit and miss this tournament. It strikes me as though Ronaldo knows this is his last chance at international success, so perhaps he is trying a little too hard to make an impact. He is, however, one of the best players in the world, and has the quality to fire Portugal to unlikely glory. The closest match of the quarters, which will either be decided by the dreaded penalty shootout, or by one factor alone; whichever of Lewandowski or Ronaldo shows up. My prediction is that it will be a one-goal in it game, with the Ronaldo factor deciding it for Portugal. Wales were underestimated by many at the start of the tournament, purely based on the fact that many thought they were a Gareth Bale-only team. They have shown so far that they are more than that, as the likes of Aaron Ramsey, Joe Allen and the heart and soul of the team Ashley Williams have all shown their international class. There is nothing stopping Wales from turning over Belgium. In their disciplined 5-3-2 formation, they get men behind the ball whilst managing to be an attacking force. They will be prepared to dig in, fight and scrap with a never say die attitude, epitomised by Ashley Williams’ desire to play on despite suffering a dislocated shoulder against Northern Ireland. Plus, there is the small factor that Wales were unbeaten against Belgium in qualifying. As the song goes, when Gareth Bale plays, Wales can beat any side. However, Belgium are looking irresistible at the moment, with Eden Hazard, Kevin de Bruyne and Axel Witsel showing the form we know they are capable of, helping them to hammer Hungary 4-0 in the last 16. It’s not just their attack, as the solid Toby Alderwiereld and Jan Vertonghen have enough know-how and experience to deal with the Wales threat. Should the big players turn up, and if the volatile Fellaini is left out of the starting XI, I believe Belgium will be just too strong for Wales. One slight problem for Belgium is that they lost to Italy who also adopted a 5-3-2 formation, so this could prove difficult for them to break down. A very tough game, decided by the sheer factor that Belgium have more individual match-winners. The world champions will go into this game as favourites, and arguably rightly so, as they are unbeaten in Euro 2016, scoring six and conceding none in the process. The Germans ooze quality all over the pitch, with a team consisting of the world’s best goalkeeper Manuel Neuer, perhaps the best central defensive partnership in football in Mats Hummels and Jerome Boateng, and a midfield containing the metronomic Toni Kroos and the stylish Mesut Ozil. Even the veteran Mario Gomez has pulled his weight up front. The Germans have impressed and excelled, even without Thomas Muller showing his true form. It will take a brave man to bet against Germany winning the tournament. However I am that brave man, as I am going to stick my neck out and say that Italy will beat Germany. Before the tournament, this Italian side was dubbed as the worst Italian side in generations. Their recent performances suggest otherwise. The charismatic Antonio Conte has adopted traditional Italian tactics; going ahead early, defending valiantly via the rocks Chiellini and Bonucci, and then killing the game at the end. The Azzurri will not make it easy for the Germans, and are unbeaten in 8 tournament games against them. I can see this record containing, as I believe the spirit and fight shown by the Italians will be too much for the world champions. Maybe I’m just predicting what I want to see, as I don’t want to see the back of Antonio Conte anytime soon! 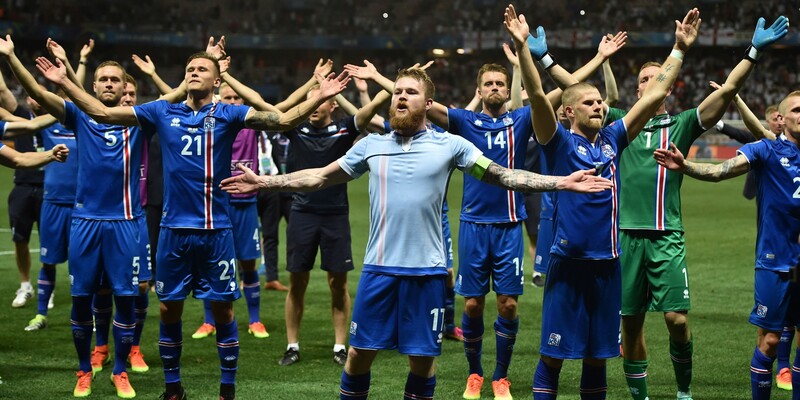 Iceland are the story of Euro 2016. The Leicester of the tournament. Not only is the whole country’s population the same as Leicester’s, but their underdog style and work rate has mirrored that of the Foxes. Qualifying for the tournament was a success. Progressing from the group was an unbelievable achievement. Inflicting England’s worst ever defeat and causing Roy’s resignation was a priceless memory for the Icelandic national side. The bravery, spirit, and even quality was just too much for England to handle. There is absolutely no reason at all that Iceland can’t follow it up with victory over the hosts. If every player does their own specific job, then why not? I do feel, however, that this one may unfortunately be a step too far for the side which have captured everyone’s hearts. Despite remaining a favourite for the tournament, the hosts haven’t shown the quality we know they are capable of, and only just survived a momumental scare against Ireland. However, the individual quality of Dimitri Payet, Antoine Griezmann and Paul Pogba, amongst others, have carried the side into the quarter finals. The French will be desperate to win this tournament on their own soil, and will see this as the perfect route into the semi-finals. I believe this France side are there to be beaten, and are yet to be really tested defensively, however there is more than enough quality in the attack to see off a spirited Iceland side. Didn’t we say that about England though?